In tracing the origin of the "club steak," you might come across the theory that the name developed because the cut was traditionally served at high-end establishments such as country clubs. Another claims that the L-shaped bone looks like something you might use to club someone. You could also hear of a club steak referred to as a Delmonico after the famous New York steakhouse, but nearly any thick-cut steak from the rib or the short loin might be called by that name. Sometimes it's called a shell steak, and it even at times gets lumped in with all of the strip steaks that come from the short loin, with some butchers classifying it as a bone-in New York strip. In any case, a club steak is a beef strip steak from the cow's short loin with an L-shaped bone; it's a cut particularly suited to grilling. A triangular strip steak with an L-shaped bone, club steak comes from the smaller front part of the short loin, nearest the rib. The juicy, well-marbled meat of a club steak is the same section of strip steak you find on a T-bone or porterhouse, but the club steak does not contain any portion of tenderloin. When fabricating a beef short loin, the butcher can either leave in the tenderloin and make T-bone and porterhouse steaks, or remove the tenderloin and make club steaks or strip steaks. Some butchers "french" the club steaks, which means they cut the meat away from the end of the bone, leaving an exposed "handle" of bone for a dramatic presentation. A steak with a particularly long piece of exposed bone might be labeled a tomahawk. The last club steak or two cut from where the short loin turns into the sirloin may contain a section of the gluteus medius, or sirloin muscle. You might hear of a steak like this referred to as a "vein steak" because of the white vein of connective tissue between the gluteus and the main muscle of the strip steak, called the multifidus dorsi. The multifidus is more tender than the gluteus, but in general, any steak cut from the short loin should be notably tender and flavorful. Because they're tender, club steaks are particularly suitable for dry-heat cooking methods such as grilling and broiling. The bone makes it more difficult to cook the steak well in a skillet because it can prevent the meat from making firm and even contact with the hot pan. Grilling gives the steak an appealing crust and a pleasant smokiness. For best results, let the steak come to room temperature on the counter before you cook it. Salt it generously on both sides, flip it frequently using tongs to prevent juice-sapping punctures from a fork, and pull it off when it registers 5 degree less than your desired doneness. For example, if you like your steak medium rare, pull it off the grill when it reaches an internal temperature of about 130 F, then let it rest for 10 minutes before you cut into it. What Does Club Steak Taste Like? 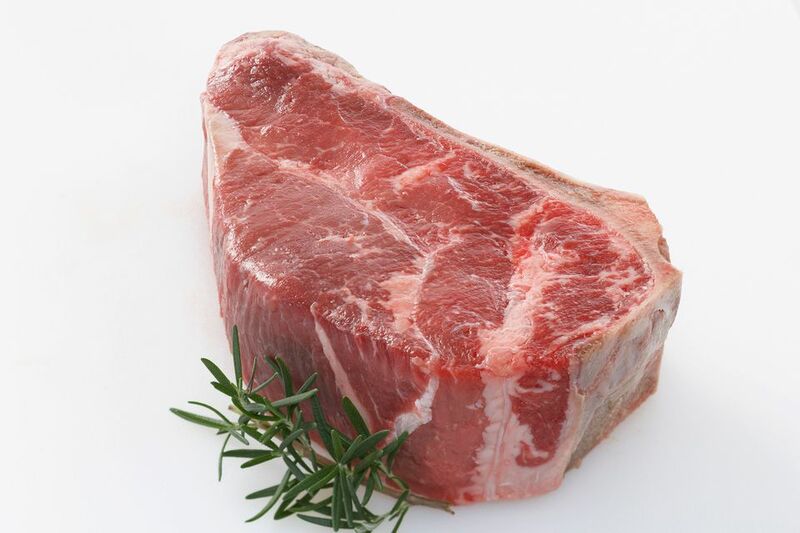 Club steak contains a good bit of marbled fat, which gives the meat a distinctively beefy flavor. It's also a tender cut coming from the little-used muscles of the cow's loin. Some liken the flavor to a rib-eye; others say it most closely resembles a New York; interestingly, it generally costs a little bit less than the other two more well-known cuts. They're not ubiquitous like T-bones and New York strip steaks, but club steaks can stand in for either cut in any recipe. Generally, you can plug a club steak into any bone-in steak recipe, particularly those done on the grill. You may need to request club steaks from your butcher as it's not a cut often on display at the grocery store meat counter. Ask for a thicker cut, at least 1.5 inches so you can get a crispy crust without overcooking the interior. Online steak retailers often include club steaks in their mail-order offerings as well. If you cannot find club steaks cut from the short loin, a cowboy rib-eye makes a fine substitute. You can store club steaks in the store packaging for up to 48 hours in your refrigerator. To freeze raw steaks, wrap them individually in plastic wrap, sealing it tightly around the meat on all sides so no air can get in. If the bone protrudes, wrap an extra layer around each entire steak, then store them together in a sealed freezer bag for up to three months. Leftover steak stays good in the refrigerator in an airtight container for three to four days; you can also freeze cooked steak for a couple of months. For best results, use a vacuum sealer and defrost the steak overnight in the refrigerator or submerged in a bowl of cool water. All beef supplies a healthy dose of vitamin B12 and vitamin B6, plus protein and minerals including iron, selenium, and zinc. But different cuts deliver varying amounts of calories and cholesterol, depending on the amount of animal fat present. Steaks from the short loin fall in about the mid-range among beef cuts for fat content, which contributes to their flavor and tenderness but also increases the calorie count and cholesterol. In general, a 3.5-ounce serving contains 138 calories and 5.5 grams of total fat, qualifying it as a lean cut by the United States Department of Agriculture. But most steaks contain at least three servings by the USDA standard, so the numbers can be deceiving.